Olivier Mosset was in town for the opening of his exhibition at Parapet/Real Humans, a project space run by Amy Granat in a storefront in the Fox Park neighborhood of Saint Louis. On view was a framed set of four lithographs of two thick black stripes on a square of white paper. The set, it turns out, was made for a Swiss Institute benefit in 2004. Granat said the work reminded her of September 11—I suppose any two vertical lines will do that. The artist compared them to an optometrist’s vision test. As someone who can’t see six inches past his nose without glasses or contacts (and who never skips his annual eye-doctor visit), that made more sense. “Language is forced on art,” quipped the artist Rachel Harrison to an audience member during the Q&A session of this event. “We’re just throwing words at art all the time. Is that really best for art? Is that really good for art? Does that make art happy? It might. It employs a lot of people.” Such is Harrison’s self-consciously funny and cynicism-free outlook for giving titles to her works. That outlook is also a good way to understand her art practice over the last twenty years. I lost track of how many times I chuckled to myself during this hour-long talk. The journalist and sociologist Sarah Thornton was interviewed about her latest book, 33 Artists in 3 Acts, at the New York Academy of Art, where she was also the school’s commencement speaker for this year’s graduating class of MFA students. The book chronicles the upper crust of the contemporary art world—the kind you read about in the Scene and Herd section of Artforum.com—from 2009 to 2013. Benchmarks in conversations and studio visits with the dozens of artists that Thornton interviewed were Jeff Koons, whom she considers to be conservative, and the high-risk Damien Hirst. Other recurring characters include Maurizio Cattelan, Ai Weiwei, and Andrea Fraser, as well as the artist couple Carroll Dunham and Laurie Simmons and their daughters, Grace and Lena Dunham. Based in New York, the six-year-old advocacy group Working Artists and the Greater Economy (W.A.G.E.) has supported a single issue: payment to artists working with nonprofit organizations in visual art. Three months ago W.A.G.E. 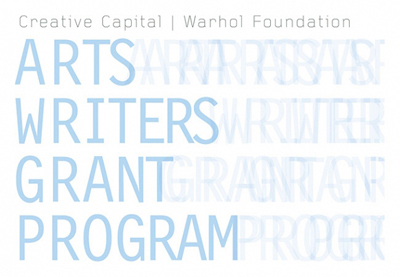 launched a voluntary certification program for institutions that wish to publicly signal their commitment to compensating artists for their work in exhibitions and for speaking engagements and writing, among other things. The group also debuted a fee calculator that establishes a minimum wage, so to speak, for creative labor, as well as a progressively scaled payment schedule based on an institution’s annual operating expenses. “Tornadic, whirling movement is something I’ve been involved in right now,” said Alice Aycock. “I’m not really into peaceful things.” This New York–based artist, who turns sixty-eight on November 20, said she trusts turbulence, not balanced or harmonious things, which is typical of her recent work, in particular Park Avenue Paper Chase, a series of seven sculptures on view in the median of an Upper East Side thoroughfare from March to July 2014. During her lecture at the New York Studio School, she talked about this work, her approach to art making, and more to a surprisingly half-full room of rapt listeners. Future generations researching the good old days at the College Art Association’s Annual Conference may take this panel for a distillation of its moment, as it casually splices ideals, philosophy, jargon, celebrity, and non sequitur with talk of art-as-money. We see also the intense longings, the search for uplift, the demands for salvation that are increasingly deposited in art. The most interesting discussion of the panel addressed whether they belong there. “It was a look of horror … or a smile,” said Scott Rothkopf, curator of the exhibition Jeff Koons and moderator of a panel discussion called “The Koons Effect Part 1,” regarding the responses he received when telling others of his research for a retrospective on the artist. Artists were interested in Koons, to his surprise, and he noted that Pierre Huyghe is fascinated by the “story that didn’t get made,” and Andrea Fraser enjoys Koonsian economics. Tino Sehgal finds Rabbit (1986) to be an iconic work, the curator continued, and Kara Walker responds to the advertisements for art magazines from 1988–89. For this panel, Rothkopf invited four American artists to discuss what Koons’s work means to them and how it has affected contemporary art. Is it possible to be indifferent to Jeff Koons? For many years my attitude toward the artist’s work has been impassive and disinterested. It exists whether I like it or not and has some visual interest, but I’ve never cared enough to form an opinion beyond that. Among the most successful living artists, Koons is comparable to Jay Z or U2: a talented mainstream artist whose early output is considered groundbreaking, but whose later works are noteworthy more for their high production values and their exorbitant, multimillion-dollar price tags than their aesthetic worth. Over the years Koons has managed to stay relevant, with critics and journalists dutifully covering his exhibitions and appearances, just as they would report on Bono’s activism and Hova’s exploits.